Made of superior fabric, comfortable and soft, no stimulation to baby's tender skin. 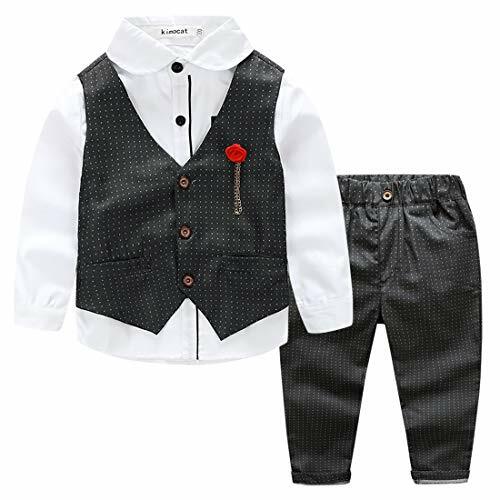 Gentleman Design, flower brooch, long sleeve shirt, dots patterned waistcoat, causal style trousers outfit. Fit For All Occasion. Elastic waist and wide crotch making it last a bit longer as your child grows. 1.There might be 2-4 cm(0.8-1.6 inch) deviation due to manual measurement. 2.There may be a slight color difference due to factors such as display pixel. If you have any questions about this product by Kimocat, contact us by completing and submitting the form below. If you are looking for a specif part number, please include it with your message.